Cantor’s Driving School offers driving lessons and driver training in all areas of Mesa, Arizona. Over 50,000 drivers have learned to drive with Cantor’s Driving School. Are you our next safe driver in Mesa? 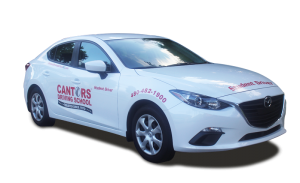 Cantor’s – The Driving School That Gets Results® in Mesa. Over 50,000 drivers have learned to drive and successfully passed their driver’s license test using Cantor’s Driving School. Cantor’s Driving School uses only professional, experienced trainers. Cantor’s Driving School is certified by the Arizona Department of Transportation (ADOT) Motor Vehicles Division (MVD) and a member of the Driving School Association of the Americas and the Safe Teen Driving Club. All Cantor’s trainers are Arizona State certified driving trainers. When taking driving lessons in Mesa, Cantor’s Driving School provides driver training on main roads such as US 60 / Superstition Freeway, AZ 101 / Price Rd, AZ 202 / Red Mountain Freeway, and AZ 87 / Country Club Drive. Driving lessons can be conducted on local roads in Mesa like Main St, Alma School Rd, Broadway Rd, University Dr, Mesa Dr, Stapley Dr, Southern Ave, Brown Rd, Gilbert Rd, Dobson Rd, and Lindsay Road. The Mesa areas covered include Sherwood, Reed Park, Community Fiesta, Oak Park, Rotary Park, Fiesta Park Village, Alma Meadows, Green Acres Park, Mesa Madrid, Emerson Manor, Escobero, Park Center Place, Hohokam Highlands, and Woodridge Lakes. Teen drivers can be picked up at any of the public or private schools in the Mesa area, including Mesa High School, Heritage Academy, Mountain View High School, Red Mountain High School, Desert Ridge High School, Skyline High School, Westwood High School, Dobson High School, East Vally High School, East Vally Academy, Pinnacle High School, Superstition High School, and Riverview High School. Zip codes covered include: 85201, 85202, 85203, 85204, 85205, 85206, 85207, 85208, 85210, 85211, 85212, 85213, 85214, 85215, 85216, 85274, 85275, 85277. Cantor’s Driving School serves the Mesa Arizona area. To get started with driving lessons, call us at 480-482-1900 or use our convenient contact form.